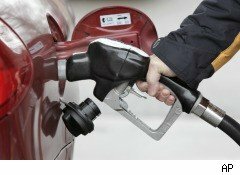 The smart money has been predicting for the past month that gas prices would fall. Oil prices have been below $90 a barrel since early August -- although it takes time for declining crude prices to work their way through refineries and to the pump -- and the International Energy Agency has cut its estimates for crude oil use for the rest of the year. But despite those factors, gas prices are by most measures as high as they were a month ago. AAA, which tracks price averages across the country, says that a gallon of regular cost $3.588 Monday. Thirty days prior, a gallon cost $3.578. Both of those figures are well above $2.731 -- the price a year back. Theories about why gas price should have fallen are simple. The U.S. economy is teetering on the edge of a double-dip recession. The summer driving season ended with Labor Day. In most parts of the country, the weather has not yet gotten cold enough to create demand for heating oil. These factors should be perfectly aligned to push gas prices lower. But one key reason that gas prices haven't dropped is that refiners are currently shipping record amounts of refined petroleum products overseas to Europe and Asia. China continues to display a nearly insatiable demand for oil. If PMI and trade data are any indication, manufacturing and the demand for China's manufactured exports are continuing to expand, despite a slowing global economy. Eventually, the worldwide slackening may hit China's demand for raw materials, but it hasn't yet. Another factor has to be political turmoil overseas. Much of the Middle East and Northern Africa are still in turmoil. The war in Libya is not quite over, though the Transitional National Council controls Tripoli and much of the country. In Yemen -- which borders petro-giant Saudi Arabia -- violence is rising, and at least 60 people have been killed since Sunday. And, perhaps most important, OPEC has signaled it has no plans to increase oil production The cartel still accounts for nearly half of the world's oil production. Between them, all these factors continue to keep demand high, and fuel the fears that supply could contract, perhaps suddenly. So don't expect any relief at the pump soon.